I picked up a couple CB650’s last fall. One of them was torn down to do a restoration/rebuild and the other was stripped down for parts. Over the course of a week I completely rebuilt one of them. 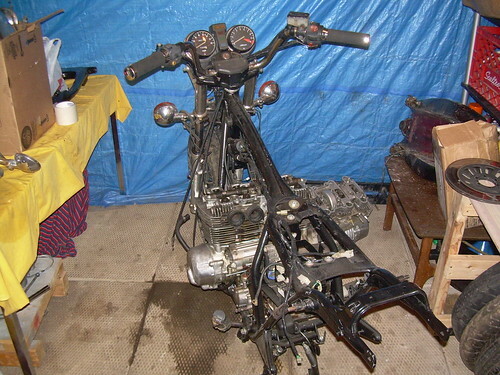 The top end of the motor is rebuilt, the frame was painted, and every part was cleaned and reassembled. The new exhaust came in this winter and now that it is warm I’ll be finishing up the project. This is the third cb650 I’ve owned. They are great bikes. Evan, a friend of mine (non-mechanical guy) gave me his 1980 Honda CB650 Custom to get running this winter. So far I have taken off the carbs, it wouldn’t run but fired using ether. The head gasket has an oil leak of some kind. Can I replace that without taking the engine off the bike? Also, the lower areas are leaking oil badly. Are there some gaskets there which should be replaced? The old Hondas, and for some reason the old 650â€™s in particular, often start weeping oil through the head and base gaskets. This is generally more common in bikes that have either been ridden real hard, or not been ridden much. Sitting is very bad for gaskets and they will dry out over time. However, replacing the gaskets on your 650 isnâ€™t a hard job. When I had my 650 motor apart it was out of the frame, but I think there is enough room to remove the head and cylinders without pulling the motor. I would run a couple searches on the forums over at sohc4.com to find out for sure. Youâ€™ll want new head and cylinder base gaskets. They can be had at lots of online locations. Iâ€™m sure you can find some using a few of the links on my site. The carbs will more than likely clean up fine. Just pull the bowls and clean out all the jets and passageways. Itâ€™s a dirty job, but itâ€™s gratifying once the bike is purring smoothly. By the way your bikes look awesome!! Thank you for any help at all! i have a cb650 custom and as i was helping take the carbs off the bike my dad broke this little part on the bottom of the carb in front of the bowl. it is like a jet of some kind probably some air jet. he broke the piece that has the flat head groove in it but it also has like a handle thing that stops it from turning to far in i think. wut is this and what does it do? thanks! Highway bars, luggage racks, and other after market parts are no longer produced for these bikes. Really the only option you have is watching ebay for people parting out machines. I have seen a couple freelance builders who designed and sold racks and highway bars on eBay, but I doubt they have made enough money to stay in business. Finding a used part is about as good as you can do. Good Luck. The screw jets that you speak of are the air mixture screws. They meter the amount of air gettin into the motor at idle. They are extremely brittle and I am also guilty of breaking some off. Once they’re broken you are pretty much out of luck, just hope they are set correctly and let them be. If you try to drill them out or use an Easy-Out you will probably do more harm than good. Generally speaking those screws should be about 1.5 turns out from lightly seated. Having them mis-adjusted will make it difficult to get your bike idling smoothly, but you never know until you fire it up. You might just luck out and find that they are set properly and don’t need adjustment anyway. thanks evan, but we were just tinkering with that carb because we checked compression on all and was good and then they all had spark but yet it wasnt running right cuz we knew that it wasnt getting proper air/fuel mixture on that carb because the spark plug wasnt burning any fuel. so i guess we werent lucky that day because we broke that air jet but we found out that it was the problem. we figured it wasnt set right because it was turned opposite of the others as we turned it it snapped off. lmao oh well do you know wut they would cost then? couple bucks? i guess that thing we broke was an idoling screw my dad took it too the local shop. does anyone have to use the choke quite often when starting the bike? I just got a 1980 cb650c, i rode it off the lot and made it about 10-15 miles before it started to strugle starting from a stop. Then it gave up and died. The dealer told me that it would need carb work but said i could ride it home. But now it will not start…it wont turn over but i can hear the starter at lest try to crank it over. Any advice on how to get it running again? Your problem might be just as simple as a toasted battery. It is REAL unlikely that you seized the motor while riding home, and if you did you’d probably know. If you had a near dead battery and drove at low rpm’s the bike might have drained the remaining juice from the battery stopping it from running and preventing it from starting again. does any body have a sissybar for a 1980 honda 650 cb thanks.ted. MY bike chokes at 55rpm in 5th when i back it down it runs pretty smooth it chokes in all gears about the same higher rpm what could be the problem? i just got my 1980 CB 650 out of my buddies barn yesterday. i looked at the last time i registered it and that was in 1998. My dad bought a 80CB custom New off the floor road it for one year,put 4997 miles on it and parked it in a garage. It all checks out OK except the carberators are they hard to rebuild and get the timing right on them? Carbs are relatively easy, just don’t strip the brass screws. Also you might need to buy new intake boots, check to see if they are hard or cracked. Make sure you check all the float valves. Hi Evan, I have an 80 cb650c that I’ve owned for 5 years. I parked it last winter and stupidly left it uncovered. T the beginning of the summer, I charged the battery and it tried to crank. Wouldn’t turn over but it tried. Left it alone for a few weeks and tried again. Nothing this time. I replaced the battery but now I can get nothing. The electronics work and I’m getting 12.44 volts at the battery. Just when I hit the starter button I get a “chunk” sound but the motor doesn’t turn. Replaced the starter and solenoid but still nothing. Any thoughts?